Great by themselves or in a rice dressing. Peel the eggplant and cut the eggplant in flat 1/4" to 3/8 " slices. To tenderize the flesh's texture and reduce some of its naturally occurring bitter taste, you can sweat the eggplant by salting it. After cutting the eggplant into the desired size and shape, sprinkle it with salt and allow it to rest for about 30 minutes. This process will pull out some of its water content and make it less apt to absorbing any oil used in cooking. If it is a young eggplant this is generally not needed but certainly can be done especially to avoid the absorption of any excess oil. Rinse thoroughly and pat dry. In a medium bowl (I like a casserole dish as it makes it easier to coat the eggplant), break an egg and add enough milk or water to liquefy or "thin out" the egg so that the eggplant can be more easily coated. Whisk the two together. In a separate bowl, mix the all purpose flour with salt, black pepper, red pepper to taste. Heat oil until a sprinkle of flour dances on the top. Dip the eggplant slices in the egg solution then in the flour mixture. Deep fry the eggplant until golden brown. Drain on paper towel and enjoy. 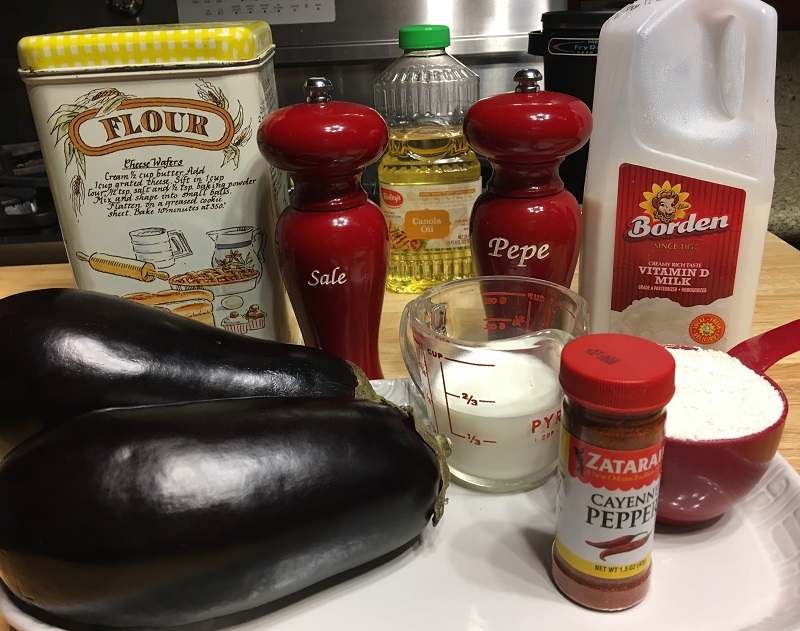 My Mom used to sprinkle a small amount of granulated sugar on the eggplant before serving. I would strongly recommend it as it seems to enhance the flavor of the eggplant! For a taste variation, mix Panko bread crumbs in with the flour.